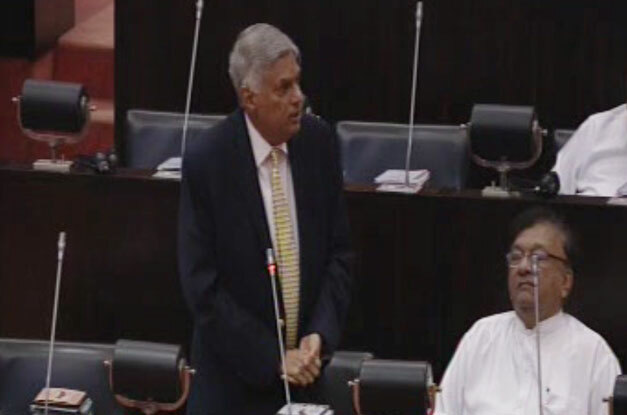 Prime Minister Ranil Wickremesinghe, speaking in Parliament today (21), assured that the National Government is still valid and that the agreement between the UNP and the UPFA has not been rescinded. UPFA General Secretary Mahinda Amaraweera, who also delivered a statement in Parliament, confirmed that the National Government is still intact and that the UPFA has not left it. Responding to a question regarding the composition of the national government, the Premier said that they are continuing with the National Government under the Constitution based on a decision taken by the parliament. “At the same time I don’t think that so far a situation has risen where we need to cancel it,” he clarified. The General Secretary of the United People’s Freedom Alliance (UPFA), who also addressed the parliament afterwards, stated that the UNP and UPFA signed an agreement and also the Parliament was briefed and approved it. “We have still not left that (agreement),” he stressed.